IT’S remarkable what emerges from a property visited in the process of being repossessed. SiN attended a single story house on Woodford Road, Rockdale recently which had been owned by George Constantinidis, an undischarged bankrupt and a relative of Achilles “Big Al” Constantinidis, who long ago partnered with Paul Keating in a piggery. George Constantinidis has been opposing attempts by BPS Recovery’s Max Prentice to secure the house since his interest in the property vested with Prentice as Constantinidis’ trustee in bankruptcy in May 2014. Those efforts included attempts to obtain alternate financing with which to discharge the debt of approximately $940,000.00, owed to Westpac in respect of mortgages over the Rockdale property and another at Erowal Bay on the NSW South Coast. The second property is held jointly by Constantinidis and his wife Gemma. Constantinidis’ efforts also included asserting that he had no equity in the Rockdale property; that it was leased to Australasian South Pacific Educational & Commercial Training Incorporated (ASPECT); that ASPECT sub-leased rooms in the house to nine tenants and that the trustee had failed to serve either ASPECT or the sub-lessees with notices to vacate. Court judgements recount how Prentice told the bankrupt by letter in July 2014 that as a result of his investigations, he did not believe the ASPECT lease existed. The courts proved similarly unyielding, never accepting a lease existed because no copy of the alleged lease was ever submitted in support of the assertion that it did. Nor did the court accept that George Constantinidis had no equity in the property, an assertion based on the bankrupt’s submission that his wife was entitled to between $500,000 and $550,000 of the value via the Family Law Act. Once Prentice served the tenants, it became simply a matter of when. On May 19 this year, Federal Court Judge Nicholas Manousaridis ordered Constantinidis to deliver vacant possession to Prentice. The judge also ordered Contantinidis to remove all ‘rubbish, cars and chattels’ that did not vest with the trustee by the same date, warning that if he did not, Prentice was entitled to remove them. The deadline for compliance was June 2. It was well past June 2 when SiN visited Woodford Road. BPS Recovery partner Dave Sampson had already turned up with a locksmith, a property agent and a BPS staff member. Also on hand were a pair of sheriffs. SiN had chanced to visit on the day repossession was to be effected. Constantinidis and his wife arrived not long after. There was a lengthy wait as the couple remonstrated with the sheriffs. At one point, Constantinidis’ wife walked down the street in the direction of Sampson, the BPS staff member and the property agent. Her comments – articulated with some volume – brought neighbours out of their homes. The locksmith moved closer to his vehicle. Eventually, the police were summoned. 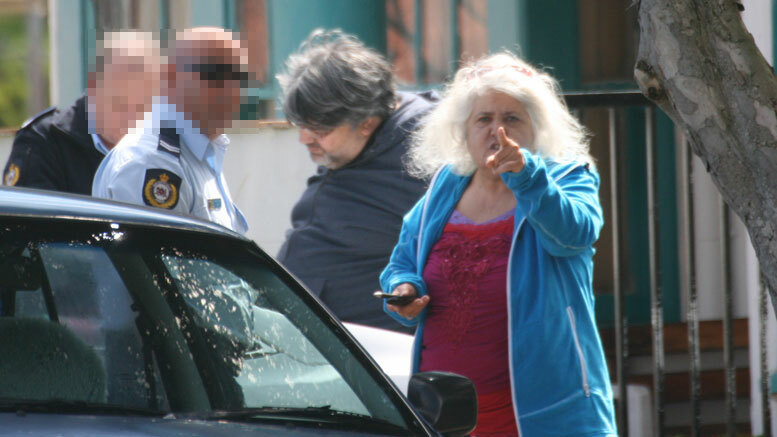 After another lengthy period of conversation, this time with police, Constantinidis and his wife left. The locksmith went to work and shortly afterwards the trustee was in possession. Inside they found a deal of goods and possessions requiring removal, but among the miscellaneous ejecta were sheets of paper containing handwritten notes, one of which caught SiN’s eye. Written in pencil on the blank piece of paper was the name Ian Lazar, the notorious lender of last resort who is currently on bail awaiting a hearing on 16 fraud-related charges. The name of one of Lazar’s companies – Tripod – was written underneath. SiN recalled that HLB Mann Judd’s Andrew Needham is liquidator of Tripod Funds Management. A call was later placed and SiN heard a curious though admittedly unrelated tale. Apparently Needham’s been frustrated by a lack of records for Tripod Funds Management. He said he hadn’t been able to identify the actual shareholders because the 1000 shares are held on trust by a Hong Kong-domiciled entity called Eagle West Co Limited. Needham said at this stage he’d recovered only $5000 of the $40,000 Tripod owesArkbay Investments, which itself is in the hands of receivers appointed by ANZ. Then he mentioned that on August 28 he’d received an email from Peter Grealish, in which the ex-liquidator advocated various means by which Tripod might be extricated from liquidation. Readers may recall that Grealish was struck from the rolls of registered and official liquidators in 2013 after being found to have lied to the Police Integrity Commission and for pulling an ‘Einfeld’, the practice of attempting to avoid traffic fines by claiming someone else was driving at the time of the infringement. As for Constantinidis, SiN understands Woodford Road has been valued at more than $1 million and Westpac has signalled its intention to also dispose of Erowal Bay, the properties being cross-collateralised. Sounds like ample opportunity for Prentice to recover his costs and fees. Be the first to comment on "Constantinidis repo coughs up curious connection"